The UN- Water report makes sobering reading, serves as a baseline and prognosis for the SDG 6. Amid its multiple highlights and recommendations, it is clear that there is an innovation deficit in water management and we still face the fundamental challenge of doing more with less. “What this report makes clear is that we must tackle weak funding, planning, capacity and governance of water and sanitation services as a top priority. New partnerships are needed, involving stakeholders within and beyond the water and sanitation sectors, to address these fundamental issues, balance competing needs, and act to get SDG 6 back on track. Data and smart technologies must be embraced so interventions can be as effective as possible and progress tracked over time”. It is very clear that the status quo is not enough to achieve the ‘water goal’ and bridge the financial gap in face of increasing demands and climate change. 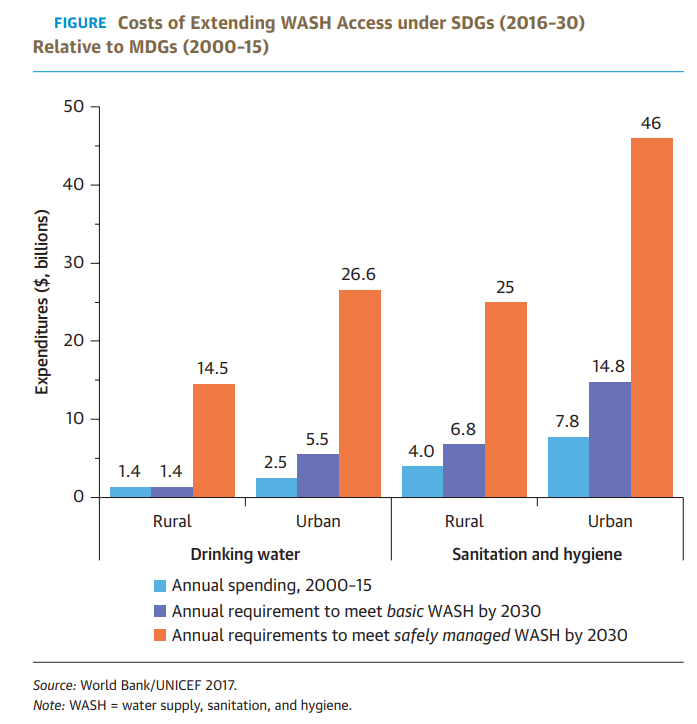 As shown in the figure, SDG6 sets the performance bar higher than the millennium development goal 7 by addressing the reliability and quality of water services, which makes achieving water supply, sanitation, and hygiene (WASH) much harder. According to (WHO and UNICEF 2017), 2.1 billion people lack access to safely managed drinking water services and 4.5 billion people lack safely managed sanitation services. Public utilities and governments are typically unable to meet development finance demands solely through public resources and have to attract new sources of financing. Unlocking private sector capital for development projects that aim at providing safe and affordable water and sanitation services to the poor is particularly challenging due to uncertaintainties in return on investment and limited regulatory framework to ensure the democratic ownership, effectiveness and accountability. This is where innovative solutions are needed. These financial obstacles can be translated into opportunities at local level in which crowd funding schemes with enabling environment can be a game changer in creating fit for purpose solutions to financial challenges and empowering young water professionals and innovators in partnership with local government, private sectors, and research groups. We must think differently about water to ensure food security, conserve delicate ecosystems and end poverty by 2030. This paradigm shift can be achieved by changing the way we manage water today, shifting from centralized solutions to decentralized solutions, reducing and managing the high level of non-revenue water, transforming our perspective from a linear ‘use and dispose’ approach to a more sustainable circular economy model, attaching values to the resources and harnessing the water, energy and food nexus in the entire water system especially wastewater (World Bank, 2018). In addition to investment, technological exchange is a core requirement for successful implementation of the SDG6 to transfer the affordable, scalable solutions that are available and it can therefore increase collaboration between regions and provide a sustainable boost to both developing and developed economies. 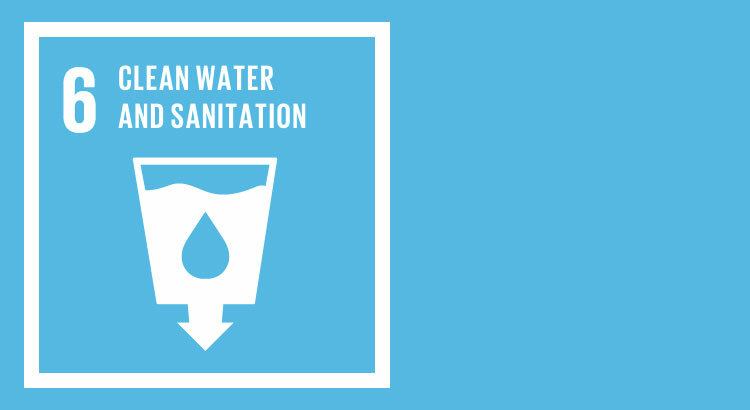 Achieving the SDG6 relies not only on setting goals, but also on a responsive approach to the voice and needs of local communities and young water professionals. By engaging youth in decision-making, empowering and equipping them with skills, knowledge and confidence in their abilities, there is a real chance that global leaders can harness the potential of youth to reach the SDGs by 2030. Connect with the global community of IWA Young Water Professionals to shape the future of the water sector! and Sanitation.” Working paper, World Bank, Washington, DC. World Health Organization (WHO) and United Nations Children’s Fund (UNICEF) (2017b). Progress on Drinking Water, Sanitation and Hygiene: 2017 Update and SDG Baselines.Geneva. Available from https://washdata.org/report/jmp-2017-report-fnal.